Join the new EuroQSAR Series page on Linkedin! Registration deadline: August 20. Please note that no registration will be accepted on site! The EuroQSAR Symposia have been taking place since 1973 and constitute major scientific events in the field of computational drug design, with further applications in agricultural and environmental sciences. 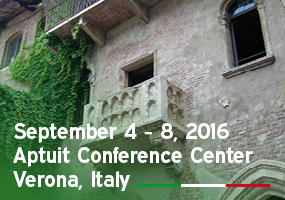 The 21st EuroQSAR 2016 symposium, entitled “Where Molecular Simulations Meet Drug Discovery” to highlight the importance of atomistic and molecular simulations in drug discovery, will take place from September 4-8, 2016 in Verona, Italy. The scientific program of the Symposium will include 9 plenary lectures, 9 keynote lectures, many oral communications, companies' workshops, poster presentations and a commercial exhibition. The conference proceedings will be published in a special issue of the ACS journal, "Journal of Chemical Information and Modeling". The symposium will take place in Verona, a splendid city of art, surrounded by the traces of its ancient history, splendid in its mythical dimension bestowed upon it by the Shakespearean tragedy of Romeo and Juliet. The city’s past centuries of history and its past splendours are witnessed by its architectural and artistic masterpieces; its culture and art are well renowned on a national and international level. For this reason, in the year 2000 Verona was recognized as a UNESCO World Heritage Site.